I 100% recommend SiteGround as a web hosting company. And, not only because I have an affiliate link with them. My disclosure is on my About page and that last link will take you there. In fact, I have an affiliate link because they are such fantastic company. I love it when a business lives up to its promises. SiteGround certainly do that! SiteGround rocks! Here is what I wrote about them earlier today in my blog post. All SiteGround posts are gathered in one category in the drop down menu on the sidebar. Stanislav G.: That’s the least I could do for you, Stephen! Stephen Bentley: OK, do you mean before I place my order? Stanislav G.: May I have the domains you plan to move over just for personal records? Stanislav G.: Awesome, thank you! I can report that the technical gurus from SiteGround moved my websites within the space of a few hours! I will use this page to keep you updated with SiteGround’s newsletters. They offer so many useful services, it makes it difficult to write about all of them here. You can now obtain Let’s Encrypt security certificates for your SiteGround websites! Let’s Encrypt is a new, free and open certificate authority that we have integrated in the cPanel. By making your websites secure, you will also take advantage of the recently released HTTP/2 protocol that works only over encrypted connections and significantly improves website performance. Find here more about how to install and use Let’s Encrypt. Our VP of Strategic Partnerships Tina Kesova shares her SiteGround story. She started working with us 10 years ago when she was only 19. Since then she had different roles before she rose to her current position. Read Tina’s personal story on what motivates a young person to stay in a company for so long and how to keep the enthusiasm. You surely know him. He only joined in early 2015 but his outstanding customer care skills lead to award after award! Truly a man of many hats, Ervin is our Customer Care Representative of the Month. He is not only a hosting guru but also practices the martial art of Wing Chun and plays the guitar. Find more things to surprise you about Ervin. Isn’t it time to join me with the #1 Web Host SiteGround? As promised here is a regular update as of May 12, 2016. Do you know which technologies we have implemented to make your websites faster? For the past year we’ve been adding more and more new speed boosters, and it was high time we highlight them all in a single place Check out our new speed page and learn how to use our hottest speed technologies on your account. Following the introduction of Let’s Encrypt certificates on our hosting platform, we are now making more changes to our SSL offerings. We will no longer offer Standard SSL and we will gradually upgrade all customers who have Standard SSL to the premium Wildcard SSL, while keeping the price unchanged. Furthermore, all new and existing Wildcard SSL users will benefit from the new price, which is more than half cheaper Read more about the changes on our blog. This month we are honoured to partner with Offscreen – one of our favourite magazines that we’ve been subscribed for since its start in 2012. It’s paradoxically a print-only magazine for people who use the internet to be creative and build successful businesses. You can read what its founder Kai Brаch says about his favourite digital tools, online inspiration sources and much more. 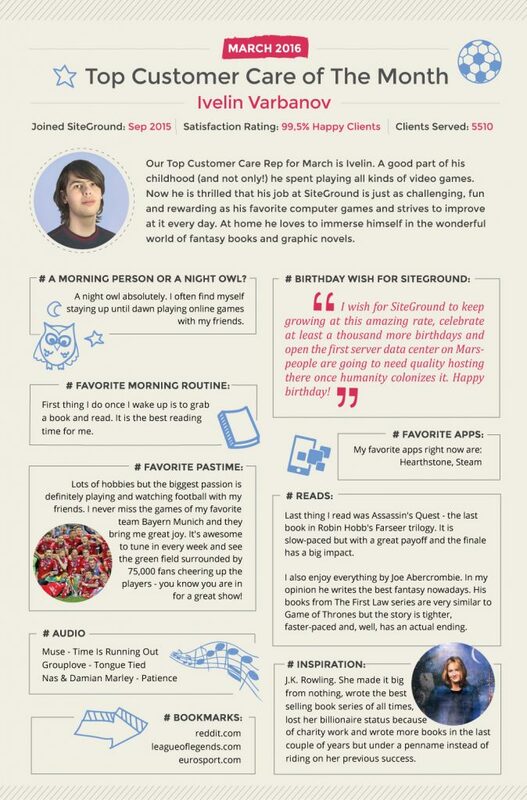 On top of that, if you share his insightful interview you can win the latest Offscreen Issue! Our top customer care agent in April is Kamen Gochev. Since he joined us in 2014 he has solved the astonishing number of nearly 25,000 customer requests and 99.67% of them are five-star! Check out his interview about what he likes to organize in the office, the prank he played on us on April Fools’ Day and more. ImageMagick, one of the most widely used services to process images, was found with a serious vulnerability that allows an attacker to execute code remotely on your site. As usual our security team reacted immediately with a solution to protect our customers. Read more about the fix on our blog.